As the weather warms up, so too should young athletes who play spring sports. One of the greatest challenges of spring and fall sports at any level is the change in temperature during the course of the season. All athletes should take time to properly warm up their bodies, stay hydrated and dress to the weather. Each year, more than 3.5 million children under age 14 will receive medical treatment for sports injuries. High school athletes will account for an estimated 2 million injuries. We talk with personal injury and wrongful death attorney Craig Milsten, a former sports writer, on the most common spring sports injuries and how to prevent them. First, what are some of the most common spring sports injuries? Athletes who have been cooped up indoors all winter cannot wait to get outside in the spring to run and walk and play sports such as tennis, golf, baseball and lacrosse. So for running and walking, you’ll see a lot of leg and foot injuries, such as plantar fasciitis, shin splints, ankle sprains and runner’s knee. For tennis players, the sport requires constant running and pivoting, so you’ll see some of the injuries associated with running, but most commonly you’ll see injuries resulting from swinging, such as rotator cuff tendinitis, wrist strains and tennis elbow. Golfers most commonly experience lower back pain, based on that lower swinging motion. Occasionally, you’ll see discomfort in the elbows, shoulders, knees and feet. Baseball injuries depend upon the player’s position. Pitchers in particular are susceptible to elbow and shoulder injuries, whereas players in the field are more prone to lower body injuries such as knee and ankle sprains. Playing baseball runs the additional risk of head injuries for all players. Even though catchers and batters wear head protection, that protection is limited compared to a football player’s helmet, especially considering the force of impact between a colliding base runner and catcher or several outfielders attempting to catch a fly ball – it really opens the opportunity for concussions out on the field. Lacrosse players benefit from a bit more padding and heavier helmets, which makes sense because contact is very prevalent in the game. Most common are running injuries, but because the players are armed with lacrosse sticks, players also face possible head and other bodily injuries. What are some injuries that players face that are not as obvious? For sports that tend to be more physical, like lacrosse and baseball, there is the possibility a ball could hit a player’s chest with extreme force. When that happens, the player risks a cardiac arrhythmia that could put the player into cardiac arrest. This is incredibly dangerous, and the fatality rate of this is about 65 percent. That’s why it’s important an automated external defibrillator, or AED, is at every game. The AED uses electrical therapy to stop the arrhythmia and bring the heart back to its routine rhythm. Dehydration is equally concerning – we often attribute it to heat, but it can happen in freezing temperatures as well. It’s important players know the warning signs of dehydration – dizziness, headache, cramps, fatigue – because those are symptoms a coach won’t notice like a torn rotator cuff or ankle sprain. Water should be readily available to players at every game. Besides keeping an AED and water readily available, what are some other safety tips you would recommend to coaches and players? Making sure athletes are wearing the proper protective gear before they take the field is crucial. That gear – whether it’s a helmet, knee pads, wrist guards – was designed to be worn for a reason. Without it, players are at an increased risk for injury. Similarly, make sure the gear fits the players properly and is in working condition. While secondhand padding might be cheaper, it’s not going to help the player if it’s outdated or extremely worn. Conditioning and proper techniques are equally important. Coaches should be keeping an eye on their players to make sure they’re using proper techniques, and allowing players enough time to strengthen and stretch muscles. They also should make sure players get a proper amount of rest and do not overexert themselves. Obviously, players should adhere to game rules at all times. So for example, no headfirst sliding in baseball to avoid head injuries. If there was one takeaway you would want coaches and players to remember during the spring sports season, what would it be? 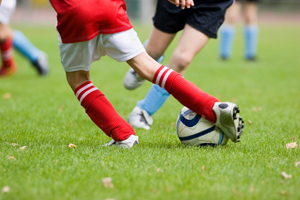 For children, more than half of all sports injuries are preventable. As a father myself, I hear this and I think we can all do our part and take simple steps as coaches and parents to make sure our children stay safe on the field or the court. While it only takes a few minutes, sometimes a few seconds, to make sure gear is on properly, the effects of not prioritizing safety in sports could impact our children for a lifetime. While we encourage safety, we know injuries can happen at any moment. That’s why our experienced team is here to help. Contact one of our skilled attorneys 24/7 for Results You Deserve®.